Merry Christmas and Happy New Years to everyone who stumbles across this blog. My sincere wishes for a happy and prosperous 2015. Still at it. . . I have been experimenting with color as the season is changing. Soon these colors will be gone and I will be working with blues and grays as winter sets in. 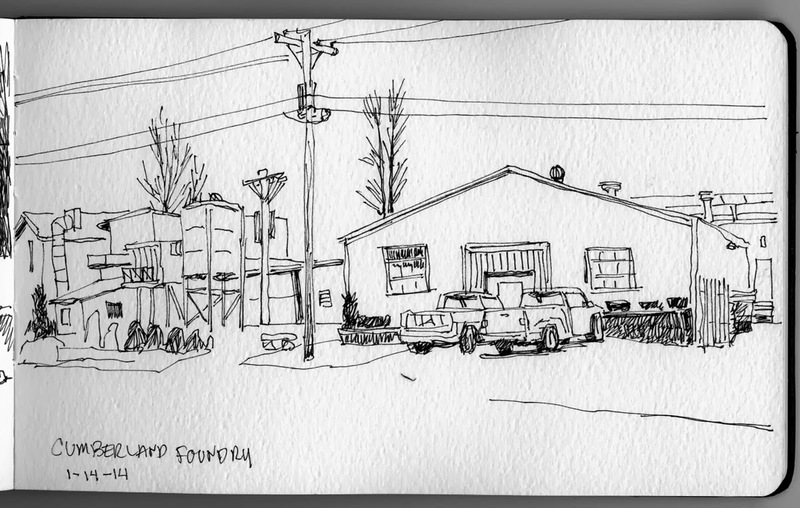 All of these sketches have been done within a one mile radius from where I work. I am fortunate to work is such a visually rich area. Although I do long for buildings that are taller than two stories. . . It has been almost two years that I began my daily sketching and am beginning to see some improvement (although slight) in my ability to represent what it is that I feel about the scene that I am portraying. I also discovered or rediscovered a lot about myself and am working on the aspects of self that drive me to do this. There is a need to create something physical as most of my world is that of pixels rather than paint and even though I can make great images in my digital world, there seems to be something more 'real' or more tangible when I put pigment on paper, and I like the fact that this is not a commercial exercise but one of the heart and mind and when the sketch is done I can close the book. A local magazine, actually 'RI Local' did this short article about me. I am flattered and honored to have them call out my scribbles. The journalist that interviewed me did a good job of representing our conversation and the reproduction of my sketches is fine. 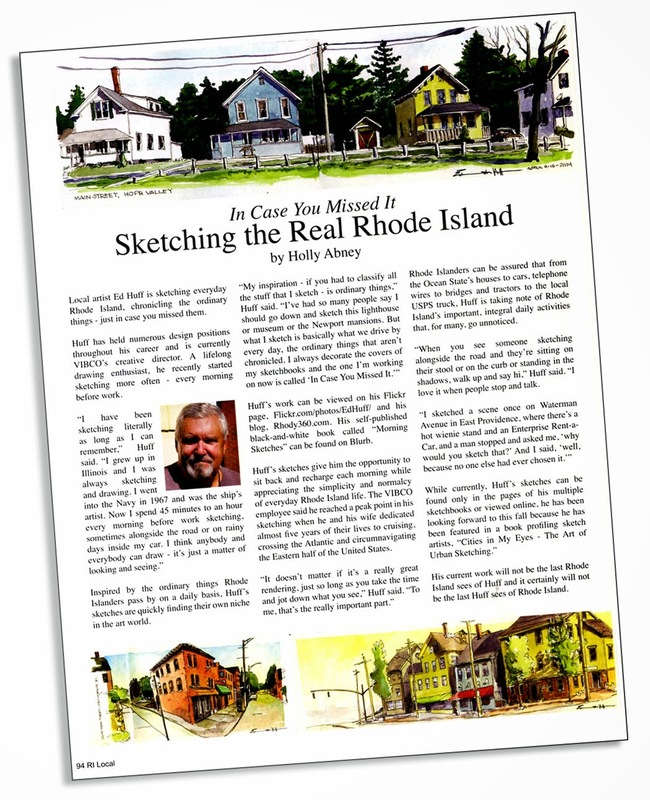 (they look better reduced in size and printed on glossy stock) Thanks RI Local and Holly Abney - I still have no idea how they found out about my sketching. . . 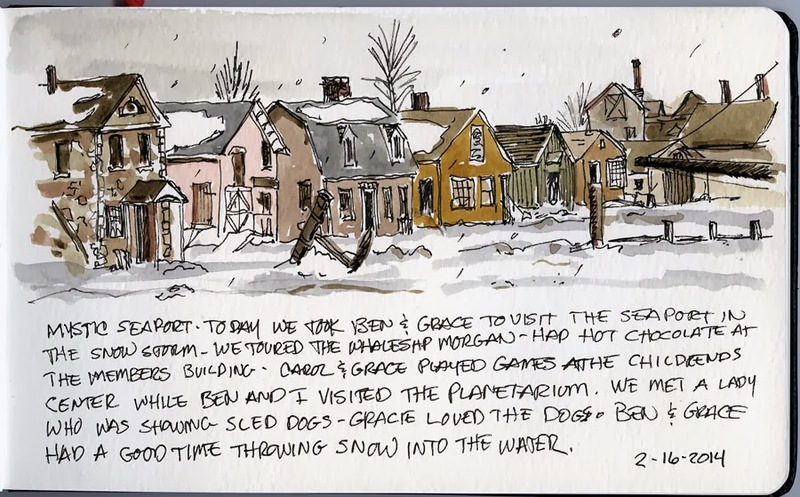 I am still sketching every morning but it is getting harder to fit it in my day as darkness is encroaching on my sketching time. 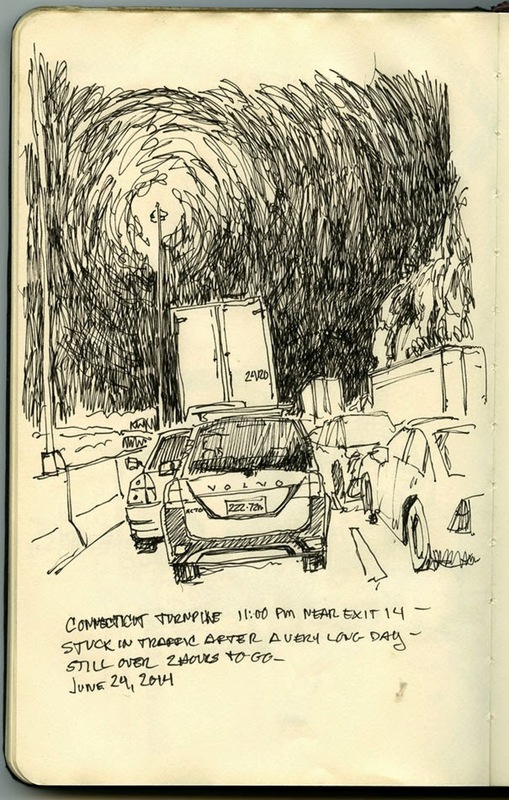 This morning I sketched the pole (sketch above) from the front seat of my car, in the rain. 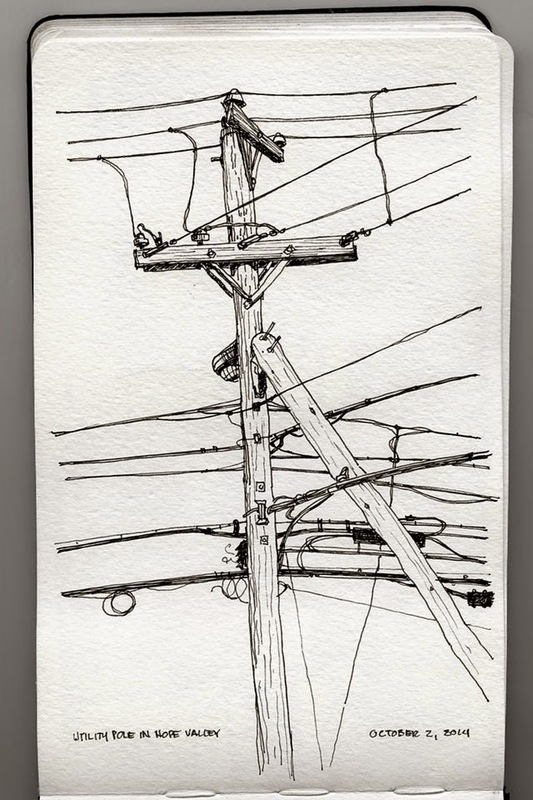 As I arrived in Hope Valley I was visually struck by all the poles and wire running down along Main Street and felt that they obscured my view. I looked harder and realized that each pole had it own personality. Like so many things in life they just needed a second glance. 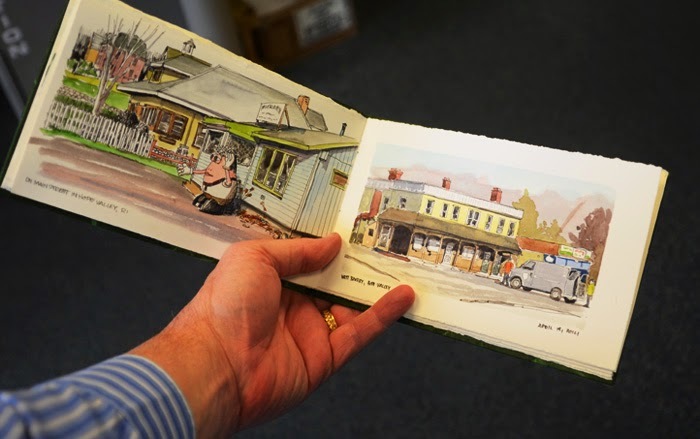 In my childhood I was a big fan of the books of Eric Sloane. 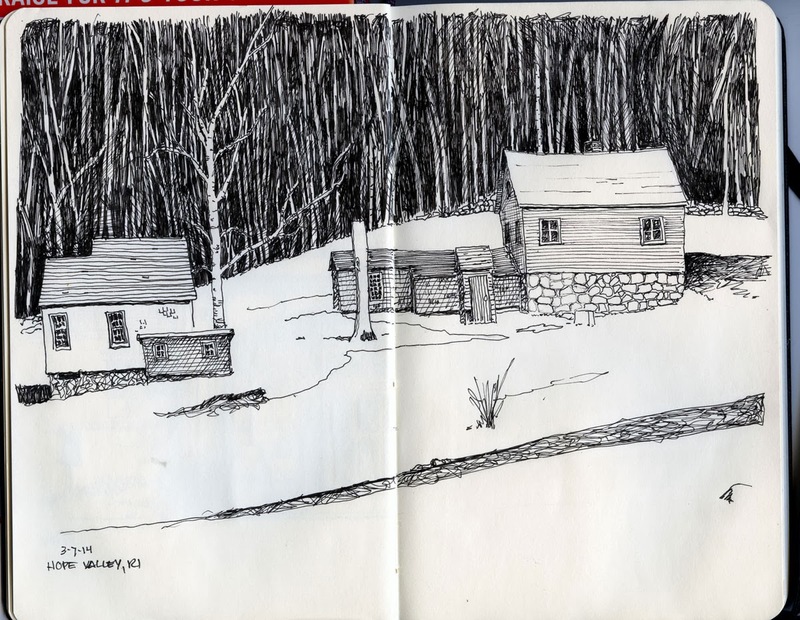 He fill my imagination with visions of a simple life and barns and old tools with his wonderful ink sketches. I think at one point I owned every one of his books and I would lay in my room and read them over and over. It has been fifty years since then and I am just now beginning to appreciate just how much of an influence he has had on my art and my thinking. Thank you Mr. Sloane. 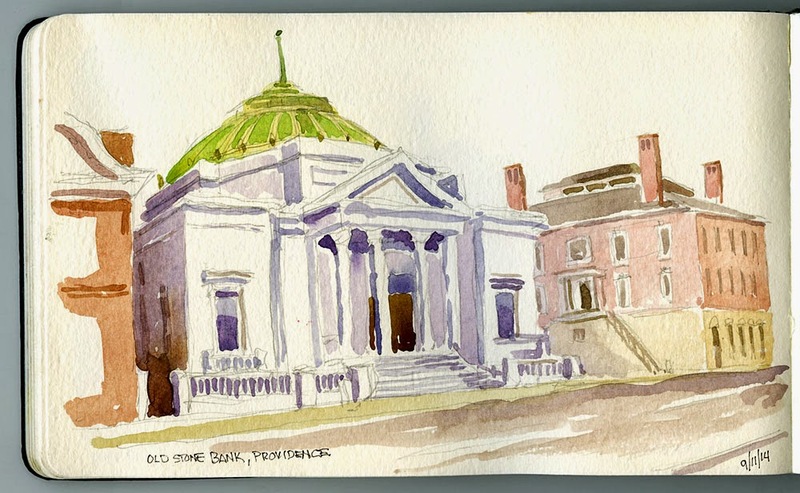 My artist frind Kathy and I have been getting out and sketching early in the morning, and one day we met down on South Main Street in Providence and tackled the buildings there. We meet at 6:00 am which I know somehow seems uncivilized to some, but it works for me and I am grateful that Kathy has the willingness to join me from time to time. I always learn so much when we sketch together. 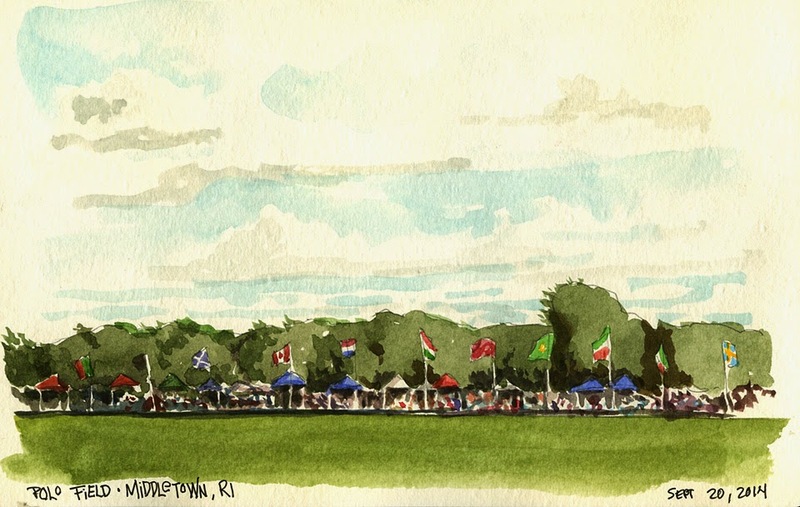 This last image I did while we were at a polo match (Newport won) in Middletown. The view is of the field and the spectators on the far side, their tents and all the flags of the different countries that come to play on this field. Now for full disclosure, there were horses and riders going up and down the field. I am a coward - and left them out - I can only imagine the mess I would have made on my paper if I attempted to sketch them. 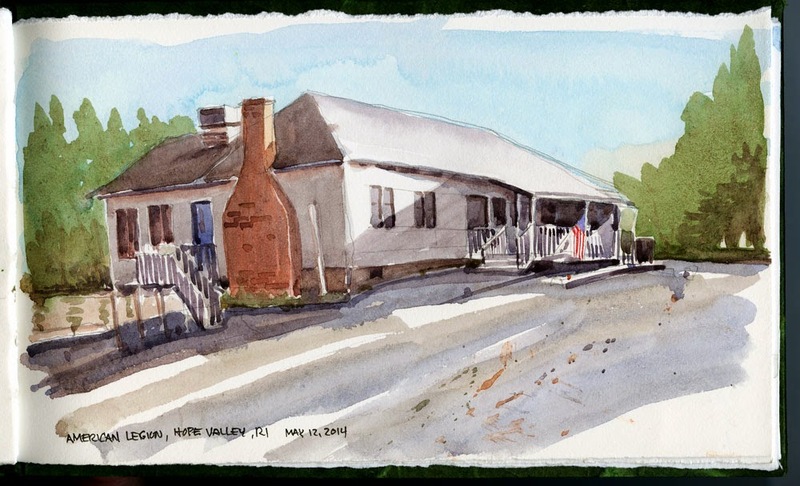 This morning I visited Bell School once again and this time instead of brushes and ink I used pixels and light. 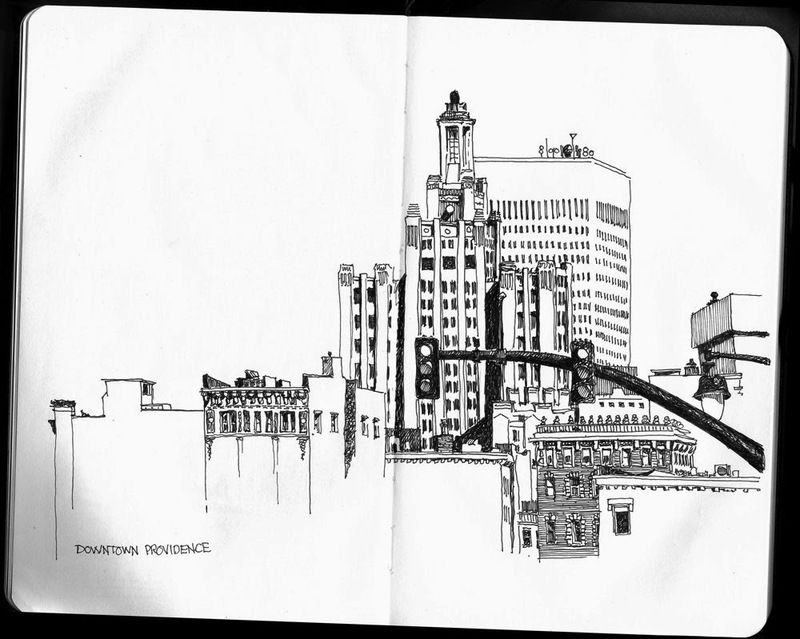 The sky was just too fantastic for me to even begin to describe in my sketchbook. So I got my camera out, and waited a few minutes for the sun to creep over the hill behind me and light those treetops. I think it is the solid design and the beautiful construction of this building the pulls at my attention. I come back often. 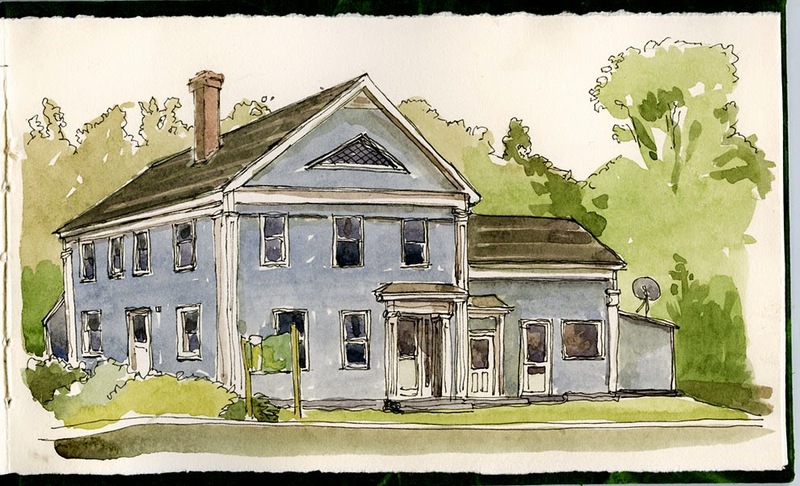 I think of all the young minds that have gone through this building from 1826 until 1935 when a new school was built. In 1826 Beethoven was composing his music and Thomas Jefferson & John Adams both died…so long ago. 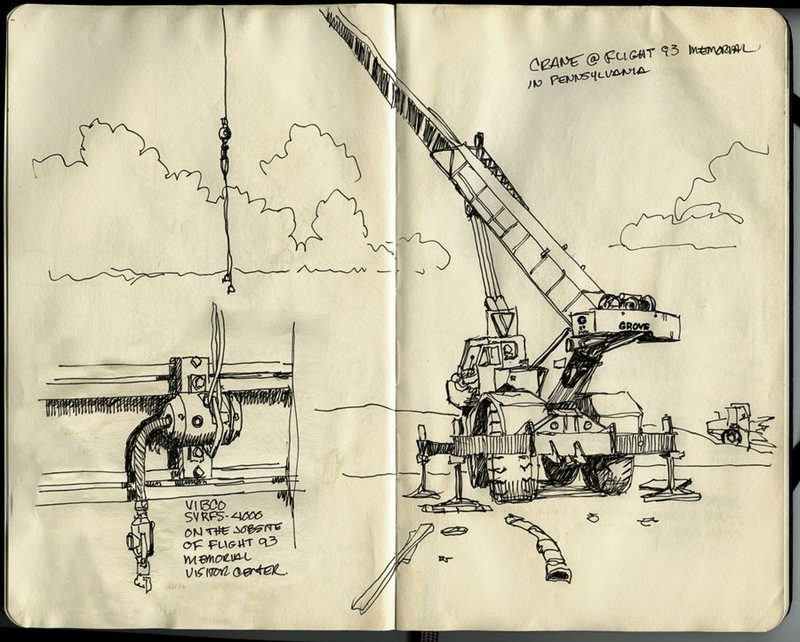 I realized it has been a while since I posted and in the meantime we had gone off on vacation again..so here are a few spreads from my sketchbook. Our visit with my brothers in Illinois was a spectacular time. It is always good to be able to spend some time with Dave and Dan. Dave has a new home in Kansas, Illinois and he and Tammi were the best hosts ever. . . thanks brothers for a great time. We went canoeing, to the fair and a truck pull and a tour of Amish country..all the time telling tall stories and having insult filled exchanges. I can't wait until next time… Ben and Grace met Dan and Dave and Tammi for the first time and it was very hard for Ben to say goodbye to his Great Uncles, and great uncles they are. 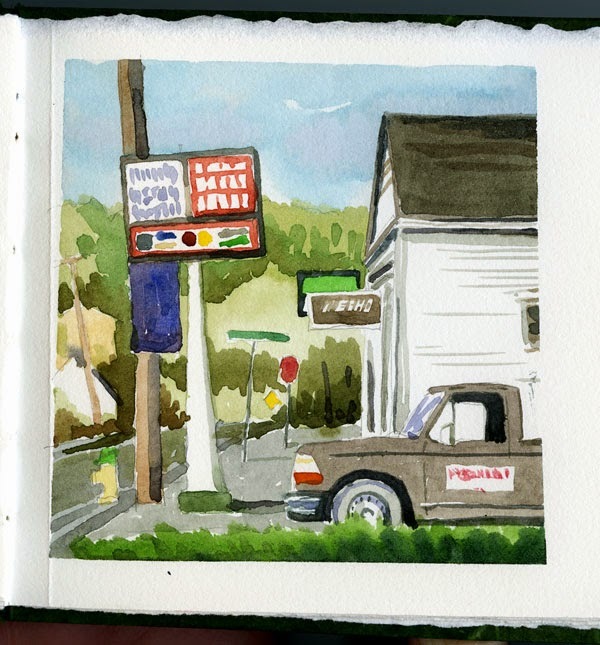 I am still sketching just about every morning before work and making new marks in my various sketch books. As I look at the pile of books I have filled, I have come to the realization that, so far, I have not made any art…I have merely been working up to that point. I have a while to go. In the past couple of weeks I have had the occasion to talk to a couple of budding creative people, one who is beginning to sketch and another who is beginning photography. They both are concerned with making art. My comment to them is that, right now, in the beginning stages, all the images they are making are crap. Right now they are learning to see and beginning to understand their tools and all they can do is keep at it long enough to attain the understanding of their tools so they can create an image that reflects their vision. A style will develop, vision will become clear and purpose will reveal itself. I am still struggling with that, but feel that I am getting a bit closer to that end. I have been fairy diligent over the past year or so trying to sketch every day. I am still experimenting with various tools and materials, with various styles and with various visions, with value and hue, with composition and with just what it is that drives me to do this. I have done well over 500 sketches and feel like I have a good start. There is nothing in these sketch books that I consider art - it's all crap - but it is my start on a journey that will hopefully lead me to a destination that allows me to produce an image that reflects my vision. Right now all we can do is keep at it until it reveals itself -- like Yoda said -- 'There is no try, only do' -- so I will continue to make my marks on paper and encourage others to do the same. On Fathers Day Carol and I went into Providence to sit along the waterfront. Carol sunned herself as I sketched. The picture above is an exercise in light and dark values. 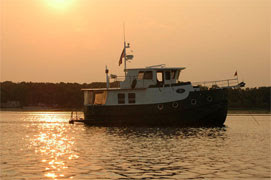 The ship is a white ship but the side facing the shore was in shadow. I feel like the sketch is a success but that I may have carried the shadow area a bit too dark. The far shore should have been a bit lighter as well..
Another sketch done before work. I have found so many interesting views down in Hope Valley. 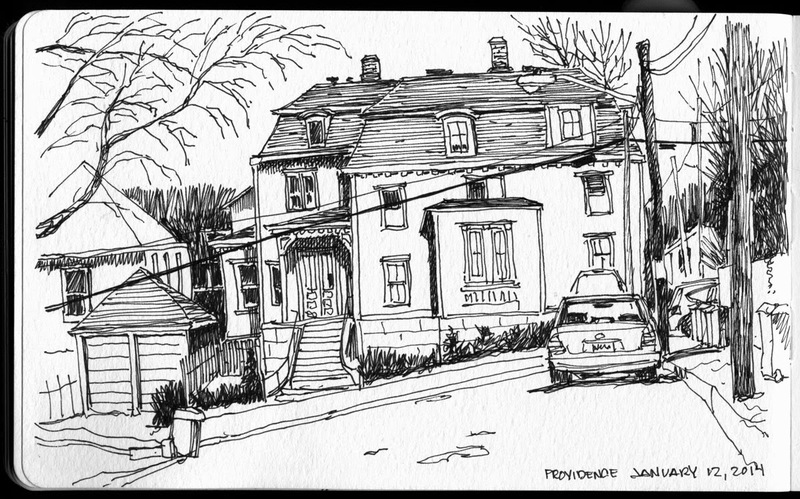 It really is a very good place to go and sketch..I guess I am lucky that it is at the end of my morning commute. Looking south down Narragansett Bay toward Conimicut Point in Warwick. 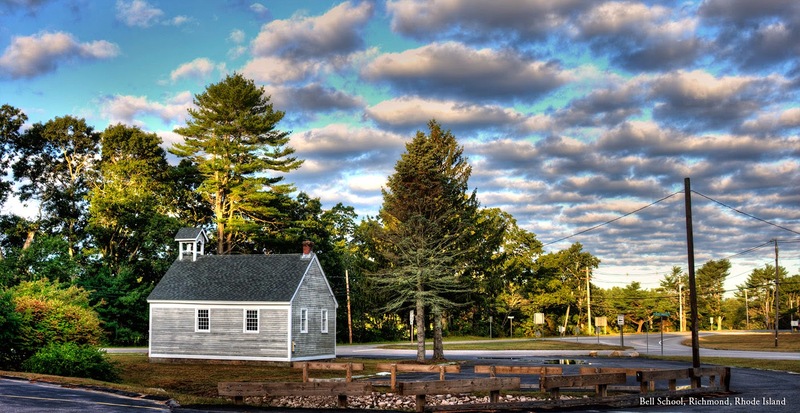 East Providence is lucky to have these nice parks along the water. This is another Fathers Day sketch, just a small one about 2 inches tall and 8 inches long. 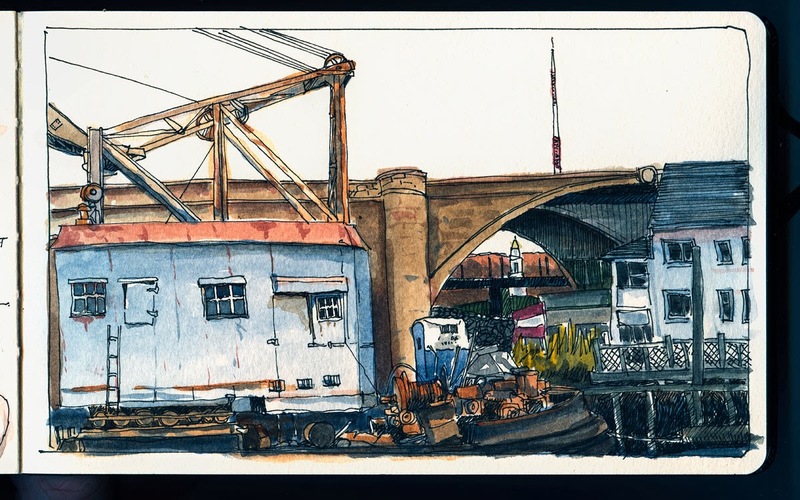 I have been following the work of a fellow sketcher in Germany who is the most extraordinary artist. 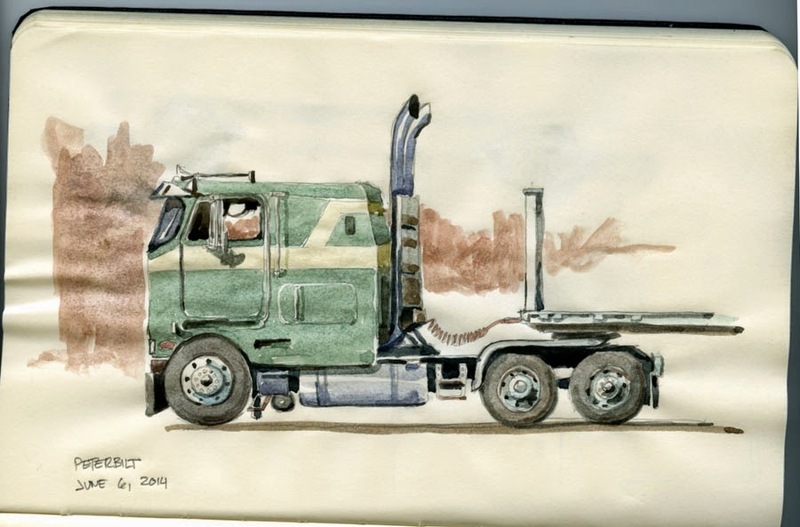 He is a master of sketching vehicles and buildings, I really admire his work. His name is Florian Afflerbach and his Flickr page is here. 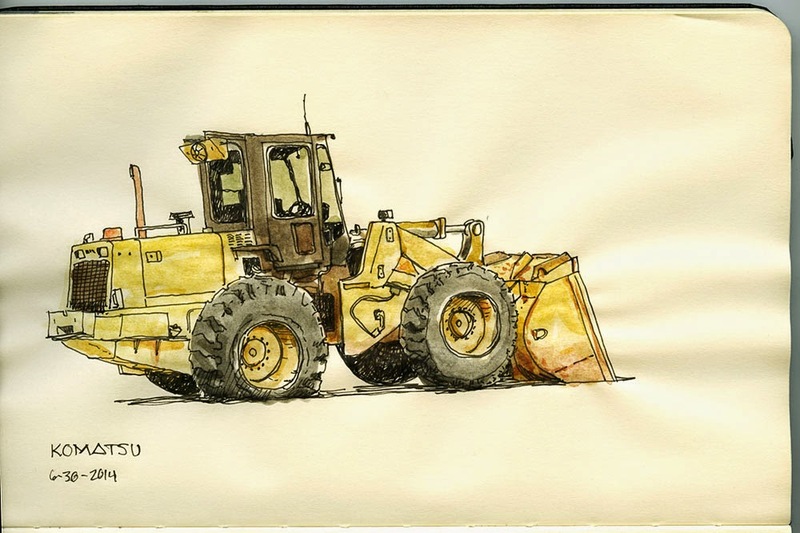 I have been inspired to sketch some vehicles and work more in pencil and wash. From exploring his work I think I am looking at vehicles and buildings and just everything more closely, which of course is really what this is all about. 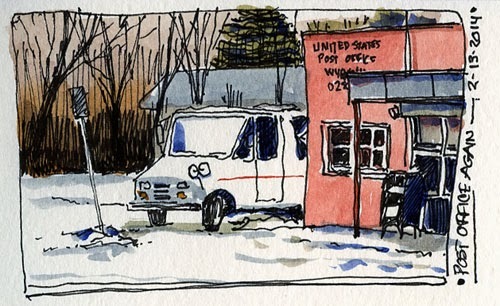 The truck in the sketch above was a rare find. It seems to be a 1975 Peterbilt Pacemaker long cab (thank you internet) He was parked in a lot in Wyoming, RI, engine running and a full load on his trailer. It is great to see this workhorse still in service. The owner must be very proud of his truck as it looks like it just came out of the showroom. 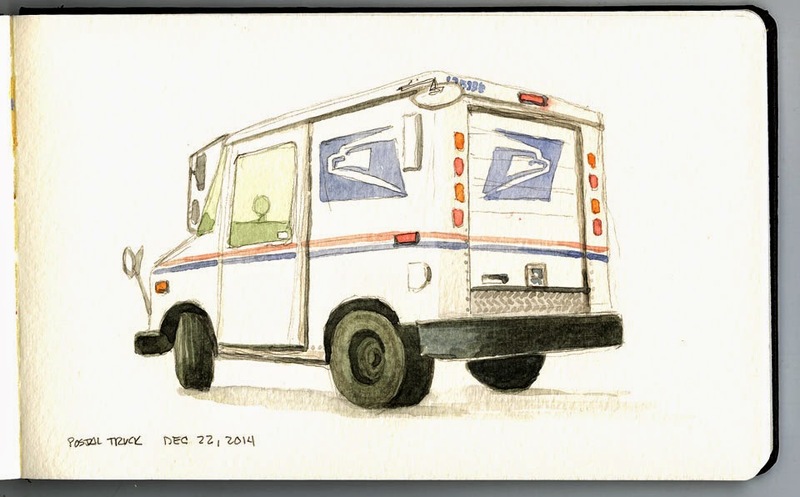 "The mail van used by the USPS for local deliveries since the late-1980s is the Grumman LLV. 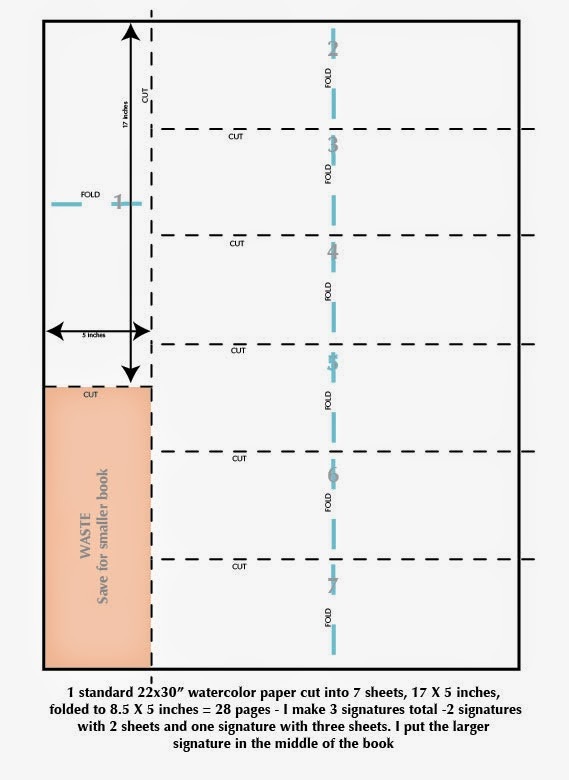 LLV stands for Long Life Vehicle. 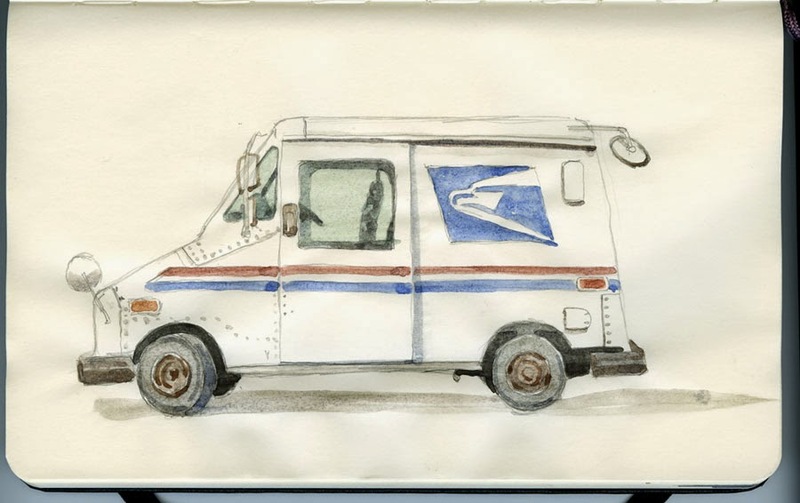 This is a custom-made mail van manufactured by Grumman Corporation, whose US$1.1 billion contract with the USPS was for 99,150 vehicles in 1986. The vehicle is built on a General Motors chassis, is 175 inches (440 cm) long, weighs 3,000 pounds (1,400 kg), can carry up to 1,000 pounds (450 kg) of mail, and is driven by a 2.5 litre General Motors four-cylinder engine. " Recently I seem to be struggling a bit more that usual. I have been experiment with different techniques and papers and it occurs to me that my sketching must be distracted or something as I feel the quality of the sketch has fallen off. Don't think that I am fishing for complements here, as I assure you I am not.. this is simply an observation. 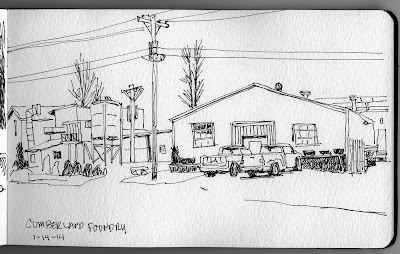 The spring has been filled with damp and gloom and I hope that warm weather arrives soon..I am tired of sketching from inside my car with the heater running. . . 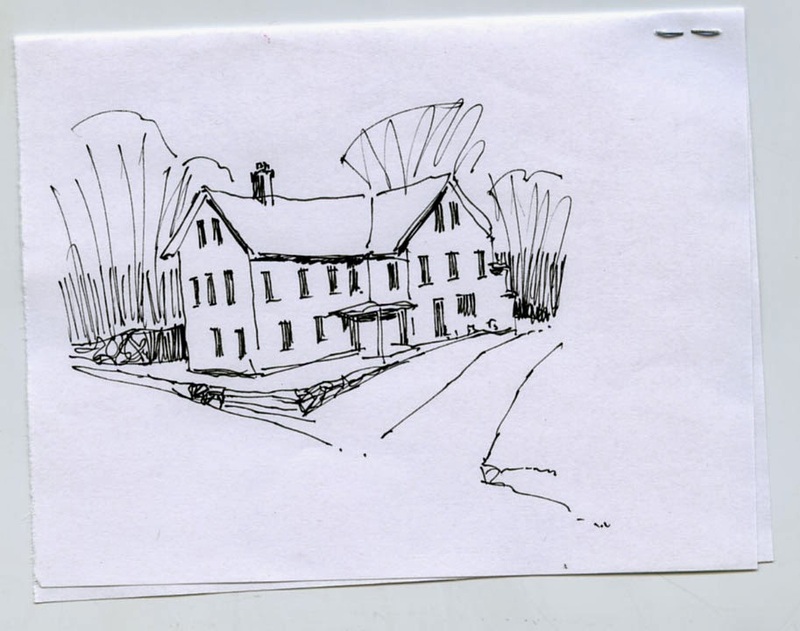 While I was sketching the house in the picture above, down on Sakonnet Point in Little Compton, it was raining hard and the light was very flat. This has been the typical environment I have been working in and I am longing for strong sunlight and my little comfy stool instead of the drivers seat in the car. I have been negligent in posting recently as I have been a bit under the weather with a cold (that is the best excuse I can come up with- I am really just a lazy lout) I have been sketching almost everyday but little of it is worth posting. The weather has finally broken a bit and has begun to get warmer. Spring is beginning to happen and the trees are getting their leaves, finally. A lady I work with told me about this place on Locustville Pond, and I had good sunlight this morning. I wish I had more time and larger paper, but this little sketch has the feel of the morning. I sketched this one the other day, another early morning sketch before work. I was pleased with the perspective of this one and may revisit. As you can see I have been experimenting with using just watercolor and leaving the pens behind. These are done lightly in pencil first and then painted..this is relatively new to me but I will continue to experiment. I find myself sketching the things that we tend to overlook from day to day. I love finding the 'unseen' views that we just pass by in our travels and try to make something of them. These are the scenes that stick in my head. . . . I have been making sketchbooks recently. . . 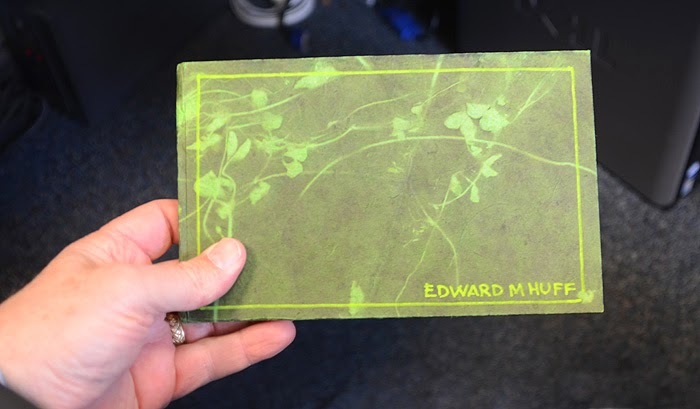 This one I made has hot pressed Arches 140 lb paper for it's pages and a great 'organic' looking clover handmade paper for the cover. This is a good size, 8.5 X 5 inches and has 28 pages all out of a single sheet of watercolor paper, some decorative paper and cardboard and of course white glue (PVA - Elmers) and a bit of thread. Some patience is required as well. This one fits nicely in my back pocket. Since I started making these I learned more and of course wanted more tools. 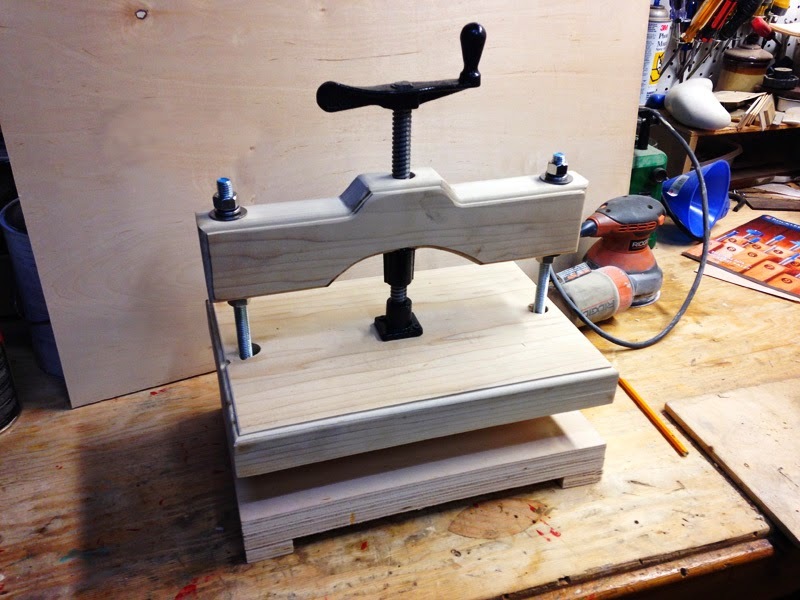 I looked at book presses and found that they are very expensive.. so I made one. 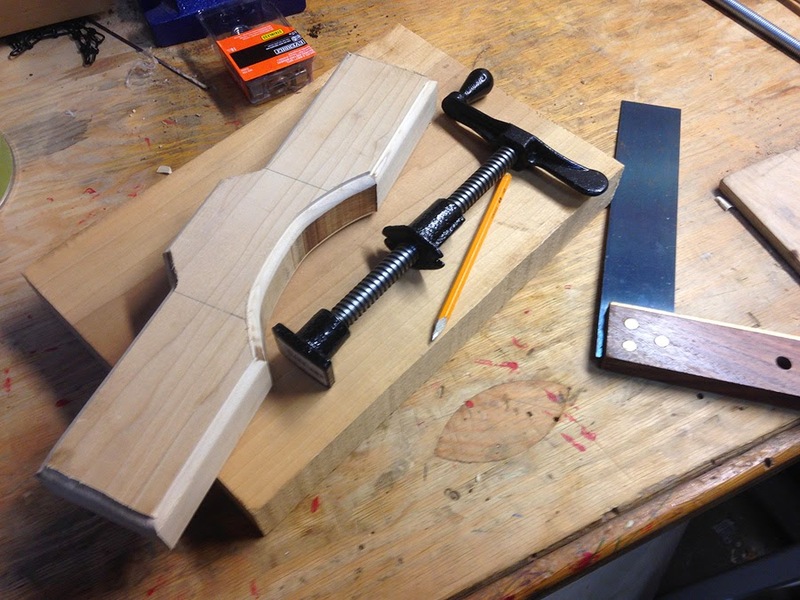 I found the screw at Rockler for about $21, bought a few nuts and bolts ($12 or so) and had the wood on hand in the shop. Here is what I came up with. And the finished press… this should make the process easier and the books a better quality. Total working time - one hour and forty minutes - total cost about $35.00 - less the price for the wood which I had. I would guess you could get the wood for about $25 - 30 - My top plate and the cross bar were made from poplar which I had from a sign project and the base made up from 3/4 inch birch ply - but you can make the whole thing from plywood and a half sheet birch ply would be more than enough to make this press. I have seen these presses on line for over $400 and an original cast iron press is MUCH more expensive. I got a couple of questions of how I cut up a single sheet of watercolor paper to make a 28 page book.. so I drew this up to help with the explanation. Hope this helps out. And I know that I am likely horrifying many bookbinders by having the grain run the wrong way on the one sheet but - hey, I live on the wild side. . . 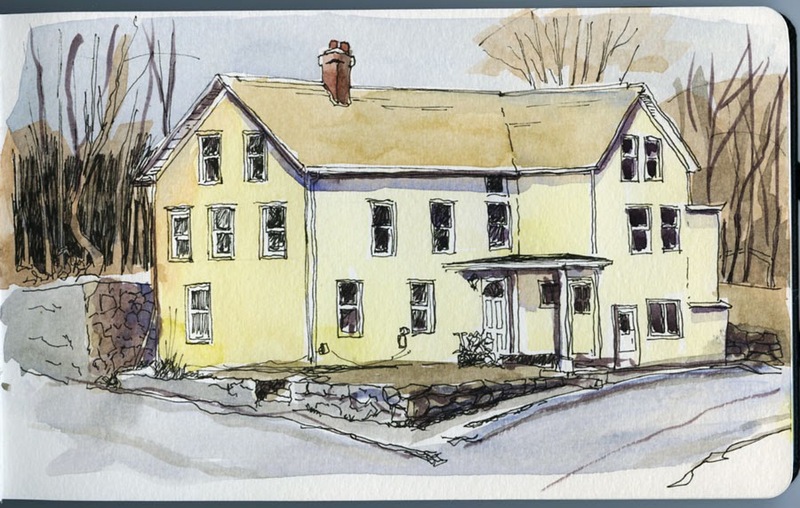 I sat in the parking lot of the Hope Valley Fire Station this morning and sketched this yellow house - a subject I have sketched before. 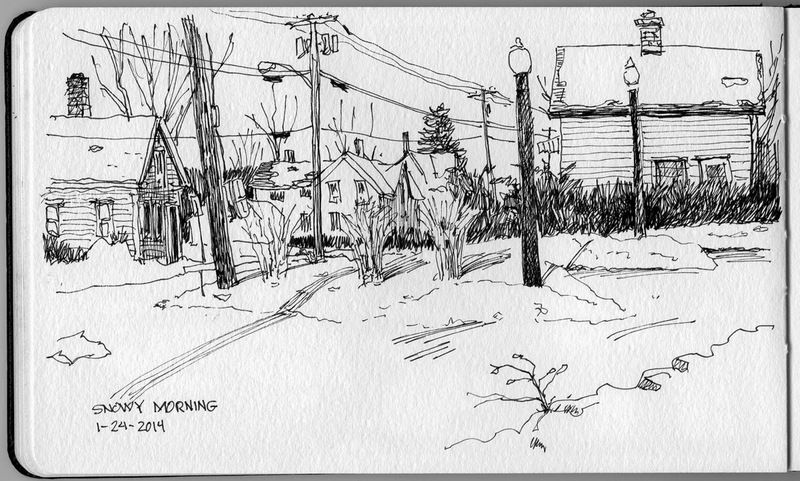 The sun was just coming up and I was glad to have some shadows to play with but this sketch is lacking something. It has little perspective. I was way too uptight sketching it I think, something is off. 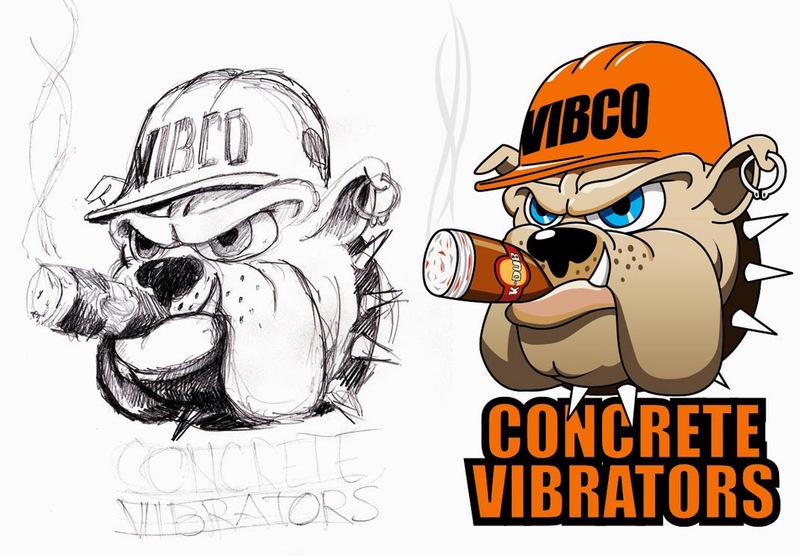 I was chatting at work and telling a co-worker about what I had sketched and did the quick little drawing below. I was shocked when I compared the two. This is a much better drawing…it has more volume, much more personality and just looks more inviting. . . go figure. I need to loosen up. . . . 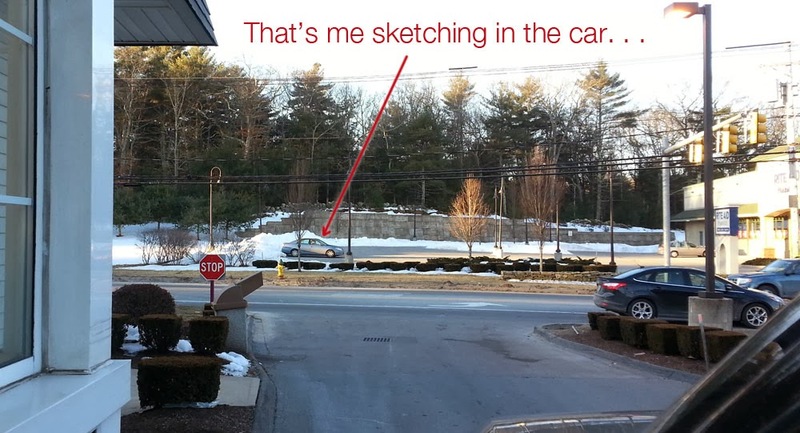 This morning I found a new place to park in an area I have been many times before. It amazes me that even familiar places can provide you with new views. 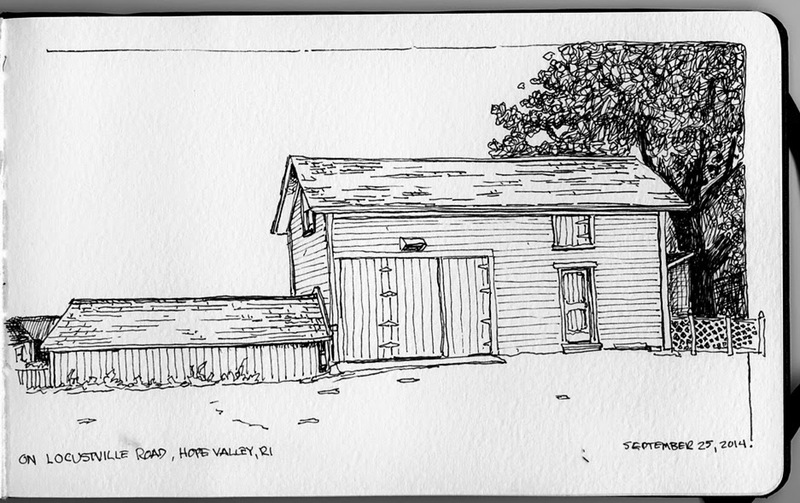 This was sketched down by the Old Stone Dam in Hope Valley. 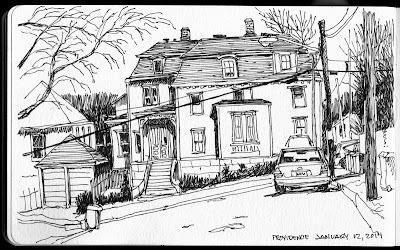 A place I have sketched many times before and have shot many many times with my camera and yet this morning as I drove those familiar streets this scene presented itself. I admit I have taken a few liberties. as I have omitted a couple of trees and some shrubs but the essence of the scene is here. I was struck by the contrast of the snow on the ground against the backdrop of the forest and the structures have such good variety in texture and proportion. 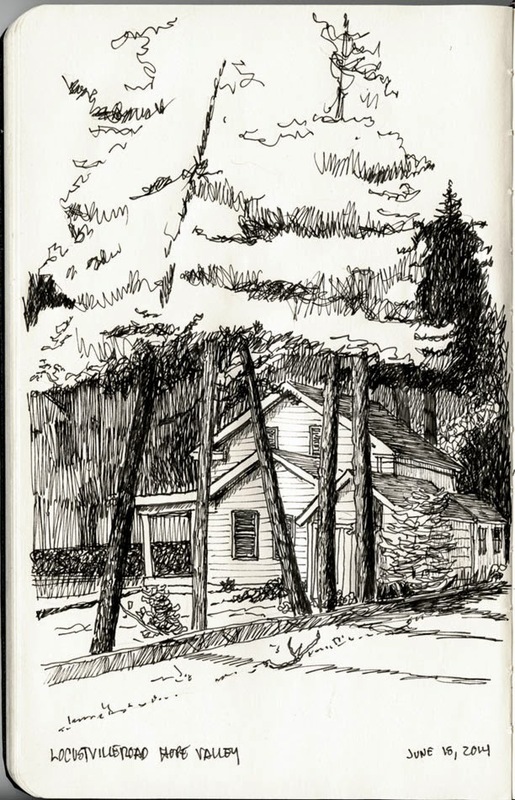 I need to work on sketching individual trees - the background scribble trees worked out OK, but the large birch next to the house on the left is a bit lame. I parked my car here at about 6:50 this morning and had this about 75-80 percent finished by 7:30 - the time I need to head to the office. I had some the forest sketched in and the rooftop on the house on the left needed more detail so I took a break at lunch and finished up the forest and touched up the house and some other details. I would guess that my total time spent on this was about an hour to an hour and ten minutes. This is a new sketchbook for me which has a much smoother paper than the watercolor paper I have been using, still experimenting with it. 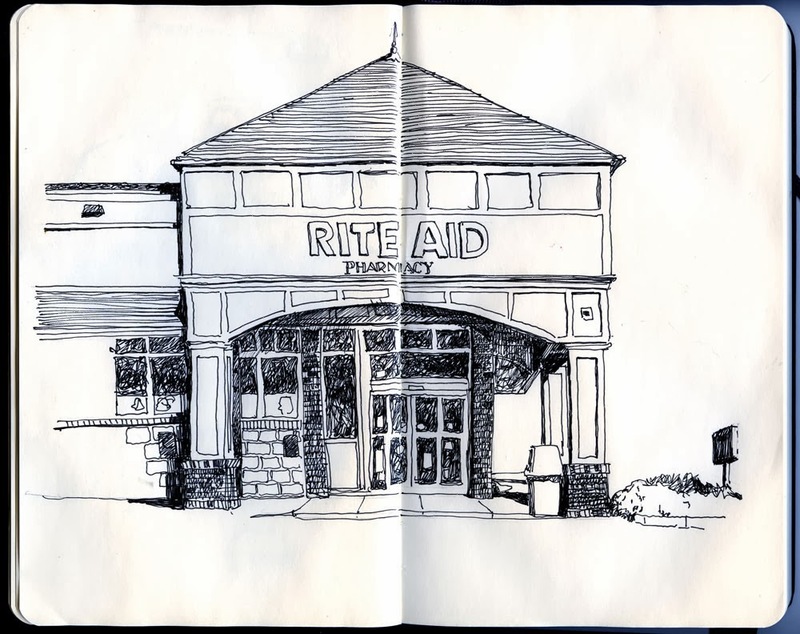 It is a standard Moleskin sketchbook and I used Micron and Pitt pens. 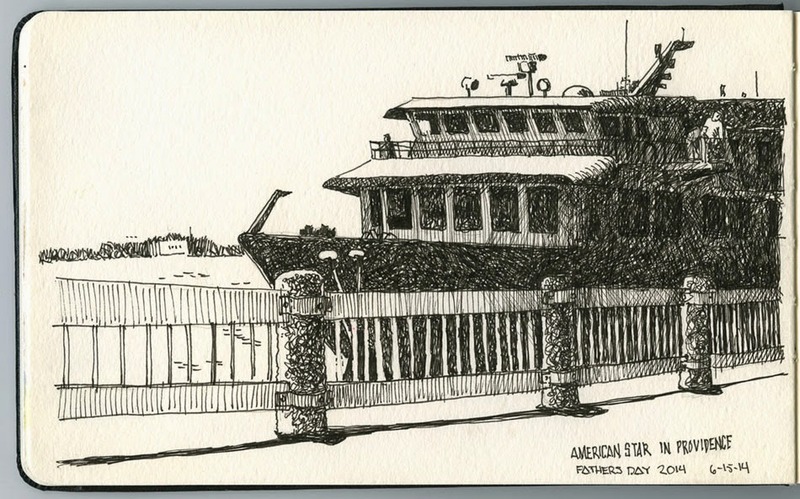 I think I will head to the art store tomorrow and look for finer line pens as I think I could achieve a wider tonal range. -- As a matter of fact, I liked this sketch well enough to make it my new header. Ok, so honestly, I have been a slacker over the past few weeks. I have left my blogging audience wonder just what kind of jerk I am. . . Well it just got away from me. I could give a lot of excuses like the Olympics are on, or the weather has been bad or whatever, but the truth is I have just been lazy. 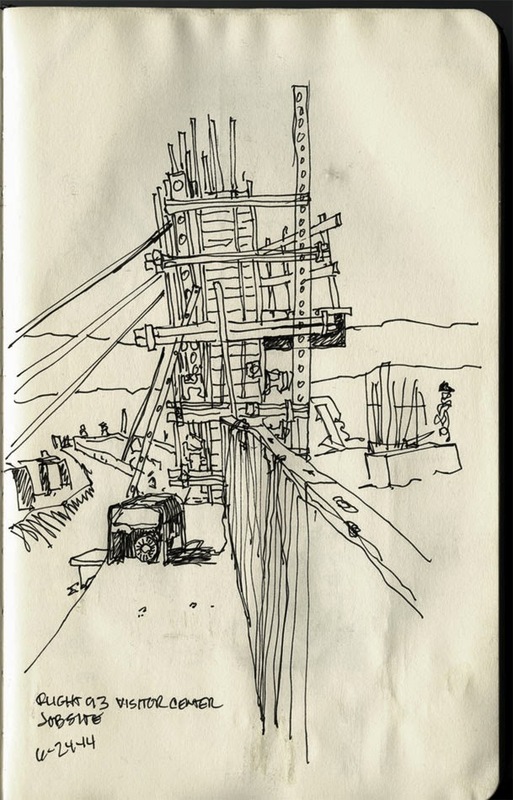 Oh, I have been sketching and posting the sketches to flickr but have just been neglecting this blog. I will try to do better, well maybe. Here are a few from the past few weeks. 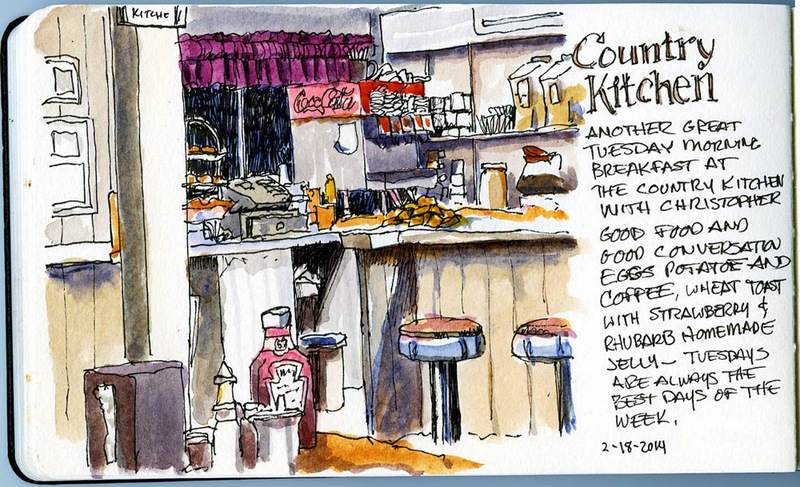 The picture above generated a lot of comments on a Facebook group I belong to..some liked the sketch while others commented on the fact that Christopher and I have been going to breakfast every week for a long time..26 years… yikes! Had a great weekend in Mystic and Groton CT - took the grand kids and played..we needed that. And a design for a tattoo to hand out at a tradeshow - original sketch and finished it up on the computer with Adobe Illustrator. You can always find my sketches up on Flickr - the link is over on the right hand side of this page. I got out for a little while today and went back down to the waterfront and attempted this crane again - getting in some of the location as well. It was a bit warmer than it has been, almost 55 degrees. I spent about an hour and 10 minutes smearing paint and ink in my sketchbook and this is the result. Should have started with the sky as it seems fairly blank. . . but am pretty happy with it regardless. I need to do some better planning to get the whole crane in the frame but I think the composition works pretty well -- I was actually trying to draw the eye into the area under the bridge and the building in the distance. And I realize now that I have completely left off a small house on top of the crane.. where the operator controls the crane..